Dressing My Truth Blog by Jessica FlatShoenista: Interim & Decision: Part 3 of How to Always Have Lots to Wear! 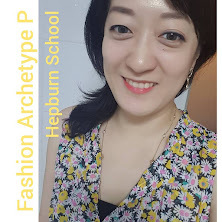 Interim & Decision: Part 3 of How to Always Have Lots to Wear! It's the nature of the beast, this 'image' business... ever Elusive, and so slightly and always out of our grasps. Well, at least for me, fashion has often been that slippery little slope. And I guess I'm actually getting 'tired' from this Chase. My recent 'stage' in my life has seen a beautiful blossoming of a love relationship, and a redefining of what I want from my job. As many of 'clutterers' would know, or would benefit to know, there is something called the 'Aspirational Clutter' which I'm sure can directly be quoted and directed towards one's stuff of Fashion. What that means is, I really haven't got my fashion shitz sorted out or figured out. My brother in law, now, HE, really has his fashion shitz worked out... His way of maintaining a lean yet functioning wardrobe is to utilize the 'One In One Out' system, with follow through... So when his old jeans get thrown out, he goes out to buy a new pair of jeans. When he brings home a new pair of jeans, his old one, EVEN IF his old jeans are not completely worn to shreds, he chucks it out! So how DOES one go about going from having probably somewhere between 500~1,000 fashion goodies in her home to something that will give her that ever elusive 'Always Having Lots to Wear' wardrobe??? Well, in the Part 2 of this series of 'How to Always Have Lots to Wear' posts, we created a list of things 'Per clothing or fashion item' that we felt would make a 'decent sized' number. We hadn't gotten yet to combining those to 'outfits' because for people like me, we need to take the 'steps' so as to not feel 'deprived' . . . OK, maybe you aren't one of them... and if you ain't, I am very glad for you!!! You're so lucky!!! Although it is meant to be for the whole year, somehow, my brain felt uncomfortable with that number. My brain doesn't know how to manage or compute 200 items! And then, there are other complications like a) I don't have some of the items on that list and get by without them pretty good, such as an LBD, b) some of the jeans I have like my dark denim spans me 3 seasons, from Spring to Autumn! c) how does laundry or dry clean cycle affect this number? To be honest I don't think my brain can handle anything more than 20 clothing items in one go. But with living in a 4 seasoned area, doing the Project 333 was so taxing for my brain, as I couldn't anticipate the weather OR the changing fashion trends. So I am coming up with a new number, one that sounds a lot smaller than 72, but much bigger than 33 to accommodate a 3~4 month period. I'm guessing, with enough practice and insight into how I actually dress, I might be able to get that number down to 45 or something, given that I learn how to accessorize better... but with not wearing hats or belts or vests, I really don't know how I'd go about creating wholly different looks without increasing that limit. Personally I think 72 is a pretty decent number to work with for a span of 4 months. It feels a lot kinder to my brain too. So I guess, if I had to name it, I'd call it my 72 in 4 months project, instead of a 33 in 3 months project. I think once I limit myself to this new number 72 for a 4 month period, I can re-allocate my fashion real estate by simultaneously checking out a) what is hanging in my closet, and b) what stuff I crave for the season. For instance, with Spring beginning here in chilly/capricious Seoul, I will count out how many spring outerwear (these typically cost the most and matter the most for work wardrobe) I have available. Let's say that I have a maroon lightweight wool coat for Spring, a black suede coat for chillier days, a black Winter warm coat for really chilly days, a navy work jacket, a brown sports jacket, and a never really worn grey-green work jacket hanging in my wardrobe. That's a total of 6 outerwear, ready for wear this Spring. And I'll be totally covered, even if I suddenly had to go to a mountain or something because my 2 winter coats are still going to be there in the wardrobe mix! So now, we have 72 - 6 = 66, 66 items to go! Knowing these colors, I gotta see if my pants, shoes, bags are plenty for a streamlined look. Then I'll have to see if my tops/scarves/jewelry such as a necklace support these two categories! My hair/skin/eye colors, as well as my vein colors will matter in selecting the most optimal choices. OK, I'm already having trouble visualizing this, so I'm going to take a quick snapshot of the above coat/outer wear colors! Be right back! Wow. This is a real eye opener for me. I have never planned my 'Color Flow' in this manner before! Or let's say that I have never planned my fashion purchases in 'entirety' before! This is why I shop so much and end up with so many orphans!!!!! @_@~!!! Because I have slight ADD and I end up mood shopping, and I come home with things that don't enhance what I already have hanging in my wardrobe! 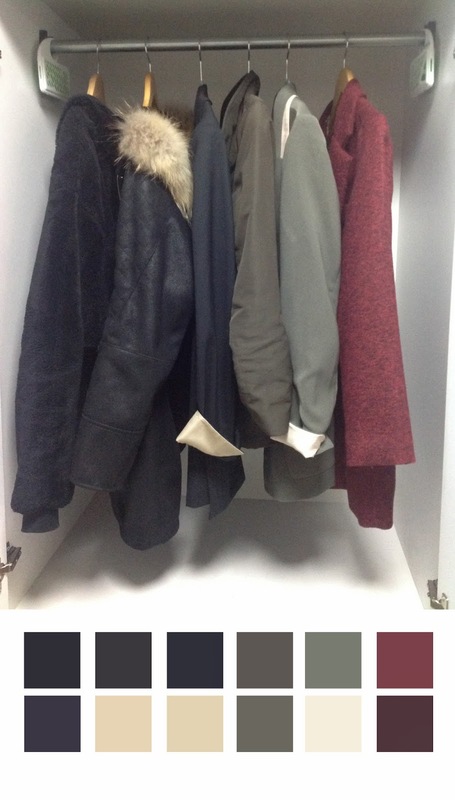 Given how the weather will become warmer and warmer, and semi-casual my wardrobe needs are for my current job, I will most likely be reaching for the 3 jackets/coat on the right; brown, khaki, maroon. But for a more formal occasion, I will be reaching for my midnight navy jacket in the middle, because it is the sharpest one of all. But it isn't as 'stretchy' in fabric so the least comfortable too. In order to prevent any unnecessary shopping, I'm going to now do a color based inventory of pants/shoes/bags, and other support pieces I can wear. I already know that I would prefer to wear more navy than black, having spent the past almost six months of Winter in black and dark charcoal! And having moved ALL my clothing stuff into my dressing room now, has my floor covered with stuff... and my bag, belt, scarves collection has just eaten up all the floor space... while my hosiery drawer needs an update so bad, as well as my shoe collection. OK. Stay tuned for my next post in the series! I am determined to find a way to say good bye to my habits of shopping too many 'orphans' in my wardrobe!! And to eventually find my own formula to Always Have LOTS to Wear!!! I think that looking at your coats to determine your neutrals is brilliant. Obviously you like these colors - you already own them. I struggle with neutrals. They are necessary, but my preference is for bright colors.